Measurement Computing Corporation (MCC) has just released documentation and examples for accessing WebDAQ embedded SW through a REST API. WebDAQ data loggers can now serve to other applications at the same time as logging data to local device memory. WebDAQ data loggers by Measurement Computing Corporation are built on IoT technology and powered by a full-featured data acquisition engine with nearly unlimited local data storage options and a web-based user interface that allows for application setup and monitoring in any web browser with access to the network. The WebDAQ Series has become a popular solution for those requiring a simple data logger with the power to acquire high and low-speed data and the flexibility to respond to triggers and alarm conditions. 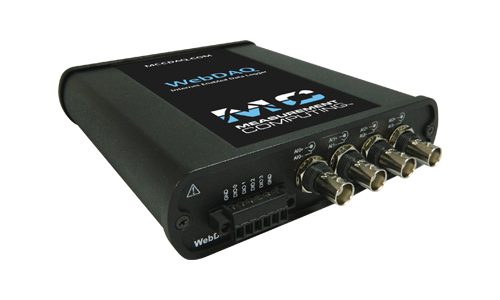 The WebDAQ 504 intelligent logger features remote monitoring and control of real-time acoustic and vibration data. Are you a LabVIEW user that wants to collect data from numerous WebDAQ units and save the data in a common file? Perfect. Are you a python programmer that wants to create a web site or data dashboard to show data from many different sources including WebDAQ? Done. Are you a C# or Visual Basic programmer who wants to create analysis routines for WebDAQ installations? A perfect example is a user performing vibration monitoring. They need the WebDAQ to record the data, but also want to implement their own condition monitoring algorithms. The WebDAQ 504 gives the user the ability to log high-speed vibration data and the REST API allows the user to read the data into their custom program for fault monitoring.